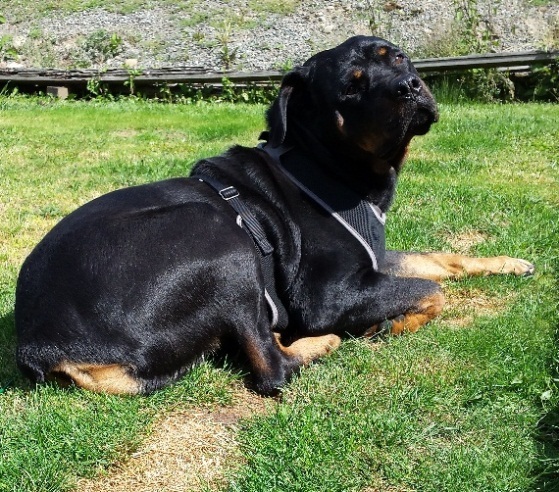 Tips to becoming the "Alpha Leader"
This part of my "How to train a Rottweiler" series will help you become the alpha leader in your dog's eye's, and help you to maintain that status. It is very important that you establish yourself as the leader from day one, no matter if you're dealing with a puppy or an adult Rottweiler that you've rescued/adopted. Most dogs aren't really interested in becoming the leader, but Rottweilers can be especially strong-willed and confident. If your Rottie does not view you as the leader, then he will assume the role himself. There are some very simple things you can do to begin establishing yourself as the leader, and more importantly, maintain that role and develop a great relationship with your dog. Here are some of the things I did with Chevy when we first brought him home at 15 months old, and continue to use them today. With established feeding times (morning & night), I have him sit and wait patiently for me to fill his dish. He's not allowed to move until I set it down and then say "Ok". I always walk through doorway's first - especially in or out of the house. I just gently press my knee against his neck and say "Me First" then walk through the door in front of him. Of course if you're training a puppy, you could just block her with your foot - just make sure you're very gentle. If your dog happens to be laying in a doorway or somewhere that you want to get to, use it as an opportunity to make your dog move. Don't go around disturbing him a lot on purpose, but requiring him to move for you to pass sends a strong signal that you're the boss. The alpha dog in a pack always leads the others! Make sure when you take your Rottie for a walk with the leash, that you don't let him pull you around. If you have your dog on a leash and he or she tries to pull you, simply stop walking. If you need to, give a quick sharp tugs on the leash until there's slack in it. Don't pull with steady pressure quick tug and release. Once he stops trying to pull you, resume your walk. If he starts to pull again, then stop and don't re-start until he stands with a little slack in the leash. If your Rottie is very persistent about pulling on the leash, like my Chevy boy was, then start practicing what I call "Random Walking." The basic concept is to be in a wide open space and randomly change your direction of travel. This keeps your dog guessing, and essentially forces him to pay attention to you. If you practice short sessions a couple times a day, it won't take him long to figure out that he has to rely on you to know which direction to go. Better yet, if you haven't already. . .Join the Let's Talk Rottweiler's pack and get 5 free training video's that will introduce you to an amazing dog trainer and philosophy. Just let me know a little about you and your Rottie, and I'll get those videos to you straight away!